These beautiful rental cabins are just the answer to a home away from home. Imagine yourself relaxing in one of these fine cabins on the Big Manistique Lake. Curtis Michigan - Surrounded in Activities! The area surround our resort is spectacular. Year round fun and activities are at your doorstep! Reservations are recommended. 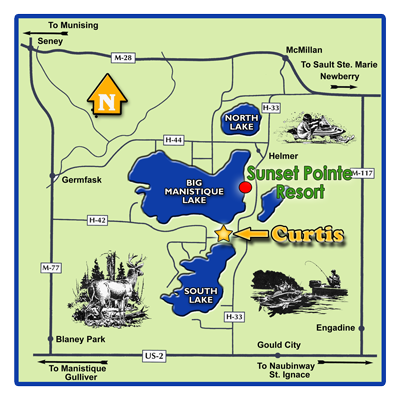 Our unique waterfront village in Curtis Michigan awaits your stay.